← Junior rod Tom, lands his first salmon. 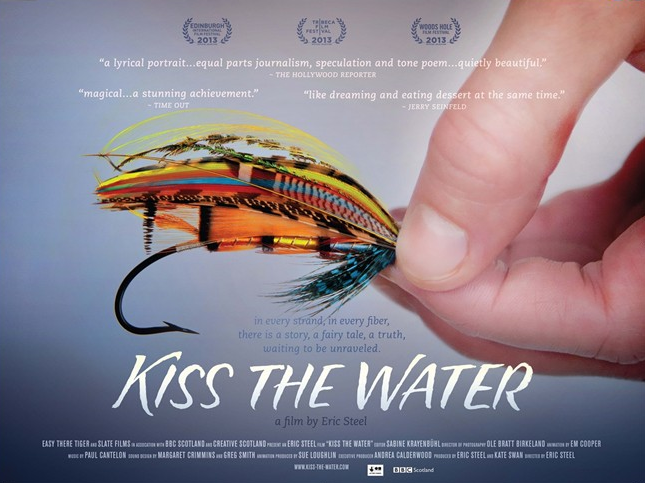 FishPal’s Anne Woodcock took the opportunity to interview filmaker and director Eric Steele this month about the making of Kiss The Water, a portrait of the world’s most celebrated maker of salmon fishing flies, Megan Boyd. This beautiful film is on general release from January. 1.Megan Boyd is a huge part of Scottish fly dressing folk lore, how difficult was it to give a true portrayal Megan’s life in the film? Answer: You’ve hit on two interesting words — lore and true. Just as angling is a “marriage” between what you can see and read on the surface and what you can only imagine is happening beneath the surface — Kiss the Water weaves together what I discovered about Megan Boyd and what I could only dream about her. 2.While making the film, could fly dressers and anglers be found that knew Megan and were able to recount their own tales of her life for use in the film? Answer: Oh yes! But I can’t give the stories away — you have to see the film! 3. As a classic salmon fly dresser, I admired her in dressing “classics” for fishing; did Megan derive a great deal of pleasure from her work? Answer: I believe fly dressing was a devotion for Megan — a craft and religion. I think her whole life was wrapped up in her flies — they were perfect little works of art and surprising metaphors. 4. What was the perceived influence on the modern salmon fly dressers did Megan have? Answer:I honestly don’t know, but I’d love to hear from modern fly dressers to see what they would say! 5.What were Megan’s favourite patterns to dress and did Megan fish with her own flies? Answer: The more complex the pattern the more she seemed to put into them: the jock Scott and the Popham perhaps? 6. Could sufficient examples of her flies still be found to use in the film? Answer: We were allowed to film a framed set that Megan had kept above her work table. 7. Megan was a great friend of Joe Bates Jnr, the famous author from the States; it would be nice think they dressed flies together, did this happen during their friendship? Answer: I did hear from Joe’s daughter Pam that Megan tied flies for Joe’s book but don’t know if they ever worked side by side. 8. What lasting impressions for those who knew little about Megan do you think the film will leave? Answer: This is a question I would never presume to answer — I don’t believe a filmmaker should tell an audience what to think. In fact I hope the film makes the audience more curious, make them want to continue to wander into another person’s life. 9. I would loved to have made the film was the experience what you expected? Answer: To me making a film is like going on a great voyage and learning a new language at the same time. I actually try not to set up expectations — to appreciate the journey as it’s happening and discovering the poetry and metaphor of language as I go along. 10. As a female tyer and angler I am always reminded by male anglers that it is women who catch the biggest and most fish, do you think the uncanny lure that Megan’s flies had to catch gave the angler who fished her fly more confidence? Answer: Both of these ideas are part of the eternal riddle. “Why does a salmon take a fly?”. I bet if you asked this to all of your readers you’d get a unique answer from every one! Thank you to FishPal consultant Paul Little for his help and guidance choosing the above questions.